In the previous post, we checked out Sega BASIC Programming and wrote some BASIC code on a modern-day computer using the Sega emulator Meka and a copy of the Sega BASIC Level 3 ROM. As an example, we wrote the main loop of a simple "Shoot 'em up" game that simply moves a target sprite around the screen based on user input; preferably the joystick. However, games written in BASIC suffer from the disadvantage that they are too slow for applications such as sprite movement; these may be sped up by increasing the step but precision of control is lost. This can be resolved by using machine code routines for parts of the program where BASIC is too slow. Goal: apply machine code routines to target Sega hardware directly for speed, efficiency and power. Follow all instructions from previous post to get setup with Sega programming before continuing. 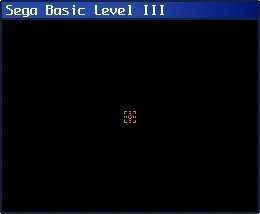 Launch Sega BASIC Level 3 ROM, that is, double click Sega BASIC Level 3 V1 (SC-3000) [b1].sc. Note: all machine code written during this post will commence at 16-bit memory address: &HF000. The value 201 will be printed, which is the corresponding decimal value of &HC9, of course. 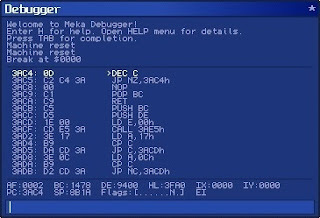 Machine code is a set of instructions executed directly by the computer Central Processing Unit (CPU). Each instruction performs a specific operation on a unit of data contained in CPU register, or memory. In this post, we target the Sega SC-3000 hardware: an 8-bit home computer based on the Z80 chip. Typically, machine code instructions are stored in memory and invoked from a BASIC driver program. Once invoked, machine code instructions are then executed one by one, similar to BASIC commands. However, unlike BASIC, machine code will not automatically stop when it reaches the end of program. Machine code must execute the RET instruction to return to BASIC; very similar to RETURN in BASIC. Each machine code instruction has a unique numerical code called an operation code, or an Opcode. In the example above, the opcode for the RET instruction is 201 or &HC9 in hexadecimal. For completeness, RET is the called the Mnemonic; that is, the symbolic name for the instruction. Check out here for the Z80 instruction set. Check out here for full (undocumented) Z80 Opcode list. Many more tutorials can be found in magazine scans from Sega Survivors web site and SMS Power. Books: the authoritative Programming the Z80 by Rodney Zaks and Mastering Machine Code (Z80). 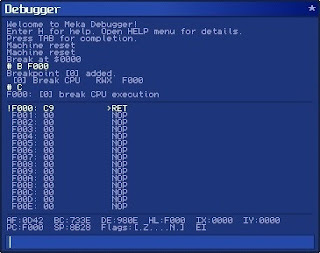 Before progressing with thorough machine code example, let's setup our environment for debugging: Make the change to the mekaw.cfg file: find debug_mode = 0 and replace with debug_mode = 1. 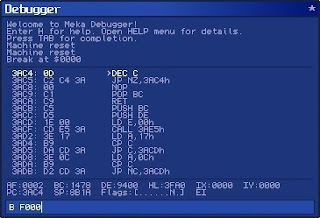 Launch Sega BASIC Level 3 ROM as before; there should now be additional DEBUG menu available. Choose: Debug menu, Enabled. 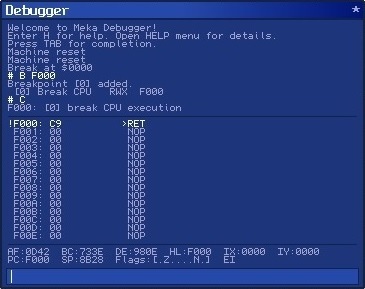 Meka will break at the memory address at current code execution. Type "B F000" to set breakpoint at &HF000 Type "C" to continue Type RUN as before Program now invokes CALL &HF000 as before but this time breaks at breakpoint set above. Hit the Enter key to step through the machine code: executes RET which returns to BASIC. Note: for full list of Debugger commands choose: Help menu, Debugger. Also, enter Up / Down arrow keys to scroll through command history. As an example, let's write the main loop of a simple "Shoot 'em up" style game, similar to the previous post, that simply moves a target sprite around the screen based on user input; preferably the joystick. However, write the main loop in machine code for increased speed + performance, rather than BASIC. The following code sample is reminiscent of the tutorial Joystick Operation using Machine Code Routine. Follow the tutorial closely to better understand what machine code instructions are required and why. Type in the following program. Important: ensure you save state before RUN: Main menu, Save State. The graphics screen clears black and positions a red target sprite. Use the joystick to move target sprite. Note: de-activate the keyboard to ensure the joystick takes precedence: Inputs menu, Sega Keyboard. In this example, moving joystick right moves target sprite right; moving any other direction moves left. Important: if joystick not configured then try these keys: "J" = left, "M" = right, "7" = up, "U" = down. Note: the machine code here actually does not RET to BASIC; press the "Scroll lock" key to soft reset. As you can see, the machine code version of the program is much smoother than its BASIC counterpart. In fact, machine code is so fast that a delay is required: without it, the sprite would simply flash across! Note: original time delay is 0300 but is stored in memory as 00 03 (Little-endian). 0004   F006 FE FF               CP 0FFH  ; any movement? 0006   F00A FE F7       RIGHT:  CP 0F7H  ; move right? Important: machine code programs will crash if there are errors; they are not as forgiving as BASIC. Therefore, ensure you save state before you RUN machine code programs: Main menu, Save State. In this post, machine code was introduced to target Sega hardware for increased speed + performance. However, a machine code program suffers from the disadvantage that it is tedious and cumbersome to manually translate each mnemonic to the corresponding opcode plus calculate all jump relative offsets. This can be resolved by using assembly language and an assembler to generate machine code routines. This will be the topic in the next post.